Eine erfolgreiche Flucht fängt nicht dort an, wo die Schlagzeilen darüber berichten. Zu diesem Zeitpunkt ist, Gott sei Dank, die Flucht vorbei. Von anderen hört man meistens kein Wort. Oder erst, nachdem eine Ära, die eine "Fluchtwelle" ausgelöst hat, zu Ende ist. Und dann leider oft nur mehr als eine bedeutungslose Zahl in einer Statistik: etwa so und so viele Menschen haben ihren Fluchtversuch mit dem Leben bezahlt, meist ohne Namen und Geschichte. Wir hatten das Glück, unsere Flucht zu überleben und somit sind die Schlagzeilen über uns in vielen Sprachen erschienen. Ich bedanke mich bei Gott, dass er seine mächtige Hand über uns gehalten hat. Two Czechs escaped to Austria by swinging a home-made cable car along the path of a highvoltage power line spanning the border, the Austrian government said today. 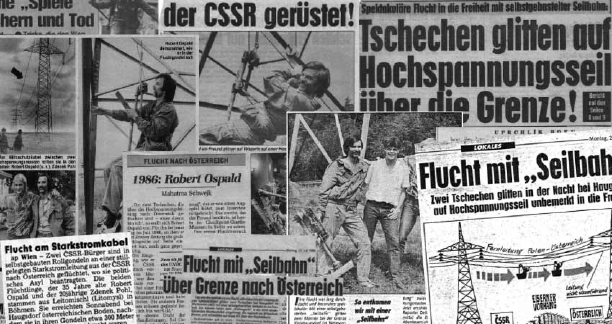 The two Czechs, Robert Ospald, 35, and Zdenek Pohl, 20, made their daring escape Saturday, careening their cable car--fashioned from planks, rags and caster rollers--amid flying sparks along a dead wire of the power line running from Poland to Czechoslovakia to Austria. Two men escaped from Czechoslovakia by using homemade trolley devices slung from a power line to cross the border, police said Sunday. A police spokesman in Haugsdorf, 40 miles north of Vienna, said that Robert Ospald, 35, a forestry worker, and Zdenek Pohl, 20, a locksmith, made the trip early Saturday. Hanging about 80 feet above the ground, the men rolled on boards suspended from sets of casters along a inactive power line for 300 yards. They had made it when they reached the first pylon on the Austrian side of HAUGSDORF the border. They appeared at a police station several hours later and asked for political asylum. They were taken to the refugee reception center. Robert Ospald, de 35 años, obrero, y Zdenek Polil, de 20 años, cerrajero, huyeron el viernes por la noche de Checoslovaquia dejándose deslizar en sendas barquillas de fabricación propia a través de un cable no electrificado de una conducción de alta tensión que cruza la frontera austro-checa.Los dos fugitivos llegaron al lugar, zona prohibida y casi infranqueable, la noche del miércoles. Permanecieron escondidos hasta el viernes, cuando, aprovechándose de una noche de temporal, escalaron una torre de alta tensión, engancharon las dos barquillas y se dejaron deslizar 300 metros hasta la otra torre, ya en Austria. 2 Czechs ride to West on high-wire VIENNA Two Czechoslovaks made a dramatic escape into Austria over the weekend by using home-made trolleys as cable cars between two power pylons straddling the border.